In fresh troubles for Nestle over safety standards of its famous Maggi noodle brand, the Uttrakhand Food Safety Department has collected samples of the 'two-minute' noodles from the company's Pantanagar plant and other places in the state. "A team comprises of state Food Safety Department officials visited the Nestle's plant at Pantnagar and collected the eight samples of Maggi noodles, which were sent to the state government laboratories," District Magistrate of Udham Singh Nagar Pankaj Kumar Pandey told reporters. Meanwhile, the Union Food and Consumer Affairs Ministry has also asked the Food Safety and Standards Authority of India to look into the matter. Besides, a class action suit can be initiated into the matter if a complaint with National Consumer Disputes Redressal Commission is filed, Consumer Affairs Minister Ram Vilas Paswan said last week. "It is a serious issue. We have referred the matter to the Food Safety and Standards Authority of India. Under the current law, FSSAI has the power to take action, including imposing fine and hefty punishment," Paswan said. On Saturday, a case was lodged against Nestle India in a local court in Barabanki (UP) here, while actors Amitabh Bachhan, Madhuri Dixit and Preity Zinta have also been separately dragged to the court for promoting Maggi brand. While the case against Nestle India and five others was filed by the UP food regulator FSDA, a local advocate filed a separate case against the three cine personalities. The Bollywood actress said on Saturday she met officials of Nestle and they assured her that there would be no compromise on the quality of the popular snack. 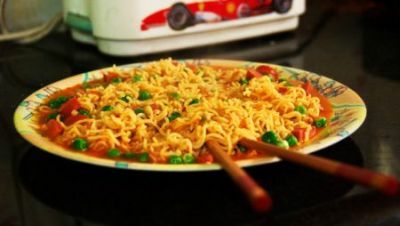 "Like most of India, I have enjoyed Maggi noodles for years. I was very concerned after recent reports and met with the Nestle team," she tweeted.